The name Silvio Berlusconi means different things to different people, but to most, there is at least a little tarnish on it. 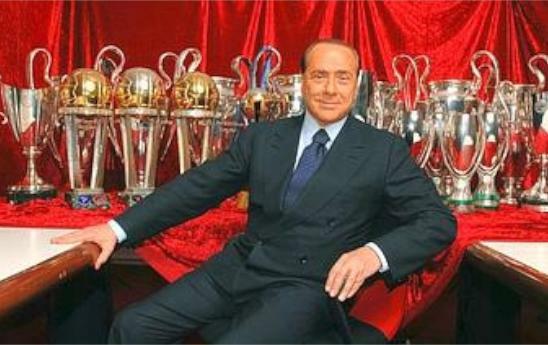 Ironically, there is a piece of silverware that is contested once a year that Silvio established that is untarnished, as it carries the name of his father, Luigi Berlusconi. The elder Luigi Berlusconi passed on in 1989, so to honor him, Silvio created a tournament, now played the last Sunday before each season begins, with a beautiful trophy going to the winners. 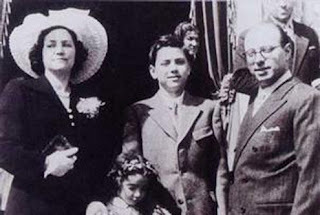 It is a grand gesture to remember one’s father, particularly when it is conveniently also hosted by the club that you own. 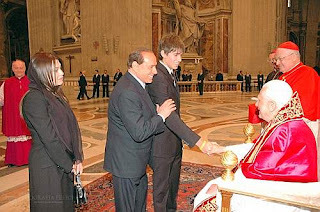 Silvio takes the living namesake, his son Luigi, to meet the Pope. The original plan was to have AC Milan face off against the Champions League winner each year. But they ended up playing Juventus instead of Red Star Belgrade in the inaugural event in 1991. They then played Inter, Real Madrid, and Bayern Munich the next 3 years, despite the corresponding Champions League winners being Barcelona, Marseille, and Milan respectively. They won the beautiful trophy all 3 of those years, but in 1995, the tradition of exclusively playing Juventus for the trophy began. Milan and Juventus have played each other 17 times for this trophy, and Juventus have won 9 times to Milan’s 8. When you add those other 3 years, Milan actually have won the Berlusconi trophy 11 times, but it is their Bianconeri rivals' wins that they are probably keeping track of. 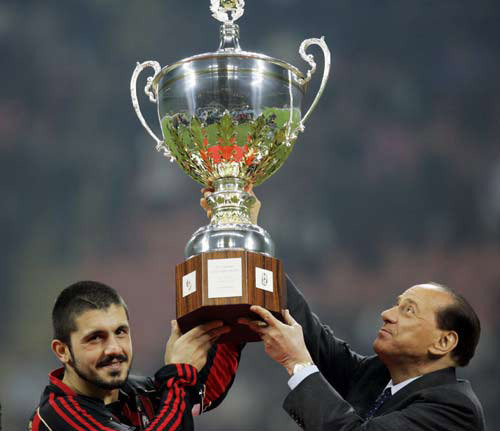 Milan’s most recent win was in 2009, when they won 6-5 on a penalty shootout. Juventus won the trophy last year, also on a penalty shootout, 5-4. Our own Pippo Inzaghi has the distinction of the most goals scored in the tournament, with 7 total. But he also has the unique distinction of being the only player to both score and win with 2 different teams. I know who Silvio Berlusconi will be rooting for this year. Well, I’m sure he picks his own team every year. But the man loves his trophies, and this one is named after his Papa, so he’d probably like to see us take it back. Also, there’s the matter of being Scudetto winners and Supercoppa winners, and then, as of Thursday, losers in the TIM Cup. Papa Berlu doesn’t like it when we don’t bring home the large shiny objects. On paper, Milan would be shoe-ins to win. As league winners compared to the 7th place finishing Juventus, we would be obvious favorites. But Juventus have carefully spent well to reinforce their ranks this summer, and are not the same team that we lost to at the San Siro last October, then won against in Turin in May. For one thing, their new coach, Antonio Conte is a past Juventus great who is charged with reigniting the Bianconeri flame beneath this team. Add Roma transplant Vucinic, who seems revitalized away from the capital, Swiss players Lichtsteiner and Zeigler, young Chilean sensation Arturo Vidal, and some guy called Andrea Pirlo, who was lured away from his team of 10 years this summer, amongst others. With this infusion of new talent, as well as the energy and heart of coach Conte, Juventus looked like a very much revitalized team when they beat us 2-1 in our 45 minute matchup on Thursday. Granted, Allegri brought the youth squad with a few 1st team chaperones, but still, this is not last year’s Juve. Milan are without Ibra due to the injury he sustained in the Malmö game. But Cassano is svelte and playing with the same passion and heart he played with at Sampdoria and before. I have not yet heard whether our South Americans will have returned from their much deserved vacations and be available for Sunday night’s match, but I think Allegri will do what he can to field a strong enough team to compete for this trophy. I think he might be getting a taste for the silver, too. Despite this match being considered pre-season, the real season starts next Saturday away to Cagliari. With the Scudetto patch on our uniforms, we are the team to beat, and so we need to remember what earned us those patches in the first place: one game at a time, consistent performances, and TEAM. I don’t say this very often, but I’m with Berlusconi on this one - Milan need to take this trophy back. If that means sending Pirlo home empty handed, I’m okay with that.